Newburgh, NY, October 14, 2018, Newburgh Free Academy P-TECH students fundraise for their June 2019 volunteer trip to Uganda. authentic community need in a foreign country, then use the knowledge, skills, and dispositions gained during travel to act as Project Managers for a community impact project in our city of Newburgh. The program is funded exclusively through donations and student fundraising. the organizers who run Red Earth Education and learn from them about community problem-solving. 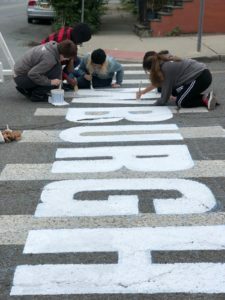 projects have involved creating and facilitating a Newburgh Youth Leadership Summit and they currently have a 1 in 3 chance to win $100,000 to fund the 2018 project to create a shared public learning space in Newburgh that traces and celebrates the city’s rich history. This entry was posted in Community, Environmental, News, Nonprofits, Travel. Bookmark the permalink.